Why we love it: The Birdman’s Wife is as gorgeously rendered as some of the stunning lithographs by artist Elizabeth Gould. It’s the story of a significant but little-known historical figure, a woman previously overshadowed by her better-known husband, John Gould, who was often known as Australia’s first ornithologist or the ‘Bird Man’. Around the time Charles Darwin was making earth-shattering discoveries, John Gould was working in his London studio, as a taxidermist and a curator at the London Zoological Society and becoming celebrated for his cataloging of new species, mainly birds. His wife Elizabeth Gould worked as his artist, rendering new species in finely crafted detail in lithograph. The novel shows how this talented woman became much more than an appendage to her husband – though up until now that’s as much as history has given her credit for. She was an accomplished artist in her own right and her ambitious husband needed her at his side. With naturalists and explorers discovering new species of animal life in the new world, John Gould needed to venture from London and after meeting Charles Darwin, decided to launch his own expedition. Elizabeth wanted to accompany her husband to Australia but with four young children judged the journey too demanding for the whole family. She made the agonising decision to take her eldest son and leave three of her four children at home with her mother and a cousin. It was a long and hazardous trip at that time –they would be away for two years – so the distance was often harrowing for her, with only long–awaited letters to keep her informed of her children’s wellbeing, even when her young daughter is seriously ill. It’s compelling to see how she manages on this journey – where greeting them at port in Tasmania is a boatload of festering convicts – and how she handles the various elements of her artistic pursuits, including a scene where the crew capture an albatross, but she can’t bear to witness the fate of the caged creature. 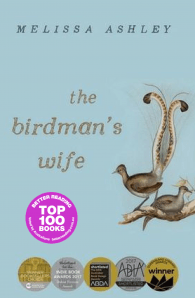 In beautiful language and told in first person from the perspective of Elizabeth Gould, The Birdman’s Wife is a fascinating and moving account of Gould’s life and the various demands of motherhood and her husband’s career. Combining research and her imagination Ashley conjures convincing and vivid images that transport us back to another time and place, breathing life into real-life historical characters such as Darwin, the governor of Tasmanian and his wife, Lord and Lady Franklin, and the poet and artist Edward Lear. It’s a wonderful and overdue portrait of a fascinating woman, giving us a glimpse into how it might have been for a woman to juggle the busy life of multiple pregnancies (and losses) with the demands of work, at a time when it wasn’t the norm for women to have careers. Melissa Ashley is herself a passionate birder and also a writer, poet and academic. She tutors in poetry and creative writing at the University of Queensland. She has published a collection of poems, The Hospital for Dolls, as well as short stories, essays, and articles. 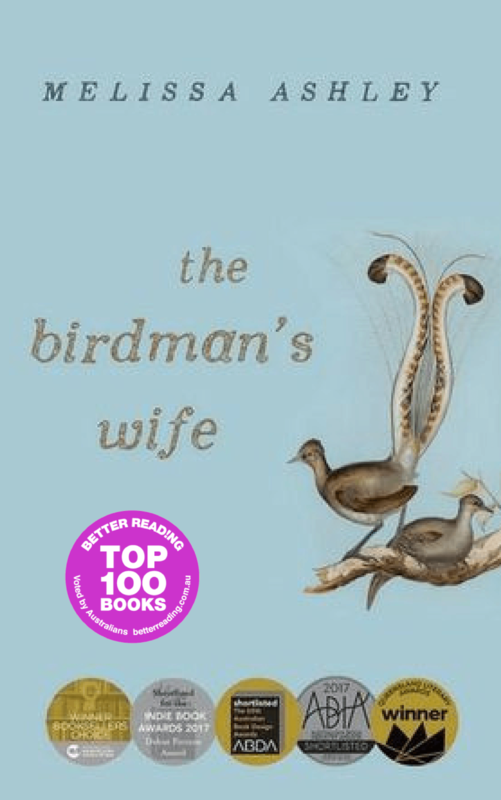 The Birdman’s Wife started life as a research for a PhD dissertation on Elizabeth Gould and became her first novel. Inspired by her heroine, Ashley studied taxidermy at the Queensland Museum. She lives in Brisbane. Purchase a copy , view our live Facebook interview with Melissa or read an extract. Want to see Elizabeth Gould’s Lithographs? Click here to see our gallery featuring her artwork!